At a press conference in San Francisco at 9:00 a.m. local time today (noon EDT; 1600 GMT), officials with the nonprofit B612 Foundation are expected to unveil key details of the group's Sentinel space telescope, which will hunt for asteroids from an orbit around the sun. Scott Hubbard, project architect from Stanford University; former director of NASA Ames Research Center in Moffett Field, Calif. So NASA researchers and other astronomers around the world are scanning the skies for big asteroids that could come uncomfortably close to us someday. 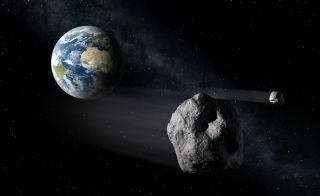 They've already found about 95 percent of the biggest asteroids thought to be out there — space rocks 0.6 miles (1 km) wide or larger, which could cause damage on a global scale if they struck Earth.